StrideBox - The Best Subscription Box For Runners - Fast, Fit, Fun, For You! Join StrideBox and discover what you need to perform better, be healthier and have more fun before, during and after running. 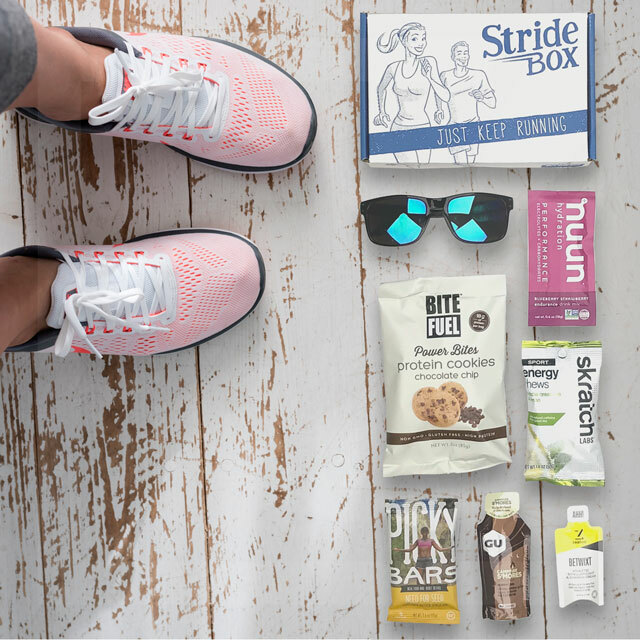 As a subscriber, each month you will receive a curated box of running nutrition, accessories, and essentials to fuel your training sessions, workouts, and races. StrideBox will help you find products to make you perform better. It will provide healthy alternatives to products you already use. The best part is the fun you'll have being surprised at what you'll find. Your favorite running thing could be coming in your next StrideBox. you a variety of products and flavors to fuel your monthly workouts, training runs, and races. Everything from bars and chews, to snacks, gum, and anything else you might need to fuel your next run or workout. Sunscreen, anti-chafe, lip balm, and hygiene products to take care of your body whether running or not. From great safety products, to essentials like a water bottle or gear bag, you'll need these items to keep you going. From a fun sticker every month, to a healthy recipe and workout to try, we want to get, and keep you moving every month. Say goodbye to the boring old fruit of the month club and say hello to fitness splurges delivered right to your front door. Packed with apparel, accessories, and nutrition products to fuel your training, workouts, and races, I like the idea. StrideBox is the gift that keeps on giving. A monthly subscription to Stridebox will put a smile on any runner’s face. What endurance athlete (or mere running slash gear enthusiast) wouldn’t want cute lil’ boxes of fitness-related goodies delivered to her door on the cheap! A way to try out new products without having to commit to buying something only to find out it tastes horrible, or gives you a stomach ache. A fun and exciting way to discover the best running stuff for you! They shop for the best running products and ship them to you!